It's the smallest houses that draw my attention. 147 11th went on the market in May of last year, for $2,250,000, and with a switch in realtor, it slid down in price to $899,000. An In Contract sign was up outside the house for months, and was still there a few days ago. An online realty site lists the fire-damaged property as having sold earlier this month for $999,000, though there's no ACRIS record on file as yet. The building has had a Full Vacate in place for over a year, though I've noticed lights on inside. Passing by the house today, I saw a new sign. Looks like it's ready for a flip. Lewis Hine was just up the block from 147 in 1912, visiting a family of brush makers at 151, but what forgotten moments in the history of 147 are on record? In 1888, 19 year-old resident Joseph Besosa wins a full scholarship to Cornell , & a few years later, a W.Kane at the same address is recruiting for a children's baseball team. 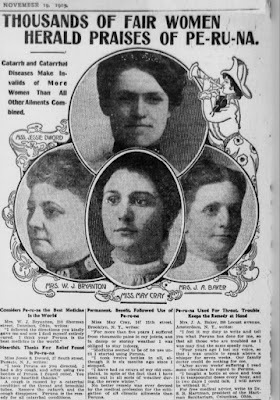 In 1905, a Miss May Cray appears, in a Chronicling America ad, endorsing Peruna, a 18% grain alcohol tonic. For more than five years I suffered from rheumatic pain in my joints, and in damp or stormy weather I was obliged to stay indoors. Medicine seemed to be of no use until I started using Peruna. I took twelve bottles in all, although it is six months ago since I stopped. I have had no return of my old complaint, in spite of the fact that I have been out in all kinds of weather during the severe winter. And what a delight, there's Miss Cray herself, surrounded by her fair companions. Watch her for a second, before she fades quietly back from view. The new restaurant at Fourth & 12th now has a name. Barrel & Fare is in soft-opening mode right now, with a formal debut coming in a couple of weeks. Until the formal date, you can check by on a day-to-day basis. If they're open that day, service will start at six, with a limited menu of food, along with beer, wine, and a couple of sample cocktails. Soft-opening prices are in effect. The tentative menu down the line will include a raw bar, salads, a charcuterie board, appetizers (including mini lobster rolls, short rib empanadas, scallop ceviche wraps), & entrees mostly in the twenty-dollars range (risotto, steak, pasta, fish, chicken, burgers & more). Barrel & Fare is across the avenue from French bistro Olivier, which opened in 2013. Unlike nearby Breadfruit Tree Cafe, with a menu that caters to a diverse, quick-moving, daytime crowd, these two restaurants bring a higher-end, casual-chic dining experience to Fourth below 9th. Though they took a little longer to get here than you might have expected, their arrival was inevitable. Look at the change of the avenue's demographics. Two bistros on one block might well be the tipping point for food culture on this stretch of Fourth, accelerating changes farther south. Tamales or truffle fries? Place your bets. 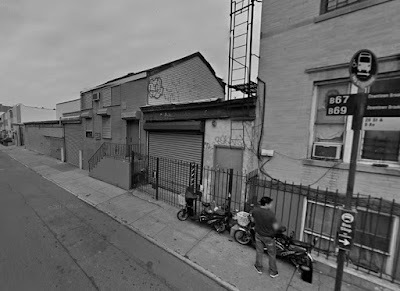 1920 Richmond Bar Inc. has applied for a liquor license at 273 13th, formerly home to the Brooklyn Voodoo Lounge, and before that the metal bar Lucky 13 Saloon The bar's name will be Paddy's of Park Slope. For anyone missing the restaurant Mezini, there may be good news! The other day I came across three burly men in front of the restaurant, and one of them (the owner) told me the place would be reopening soon "a little differently." On that tantalizing note, we'll conclude. 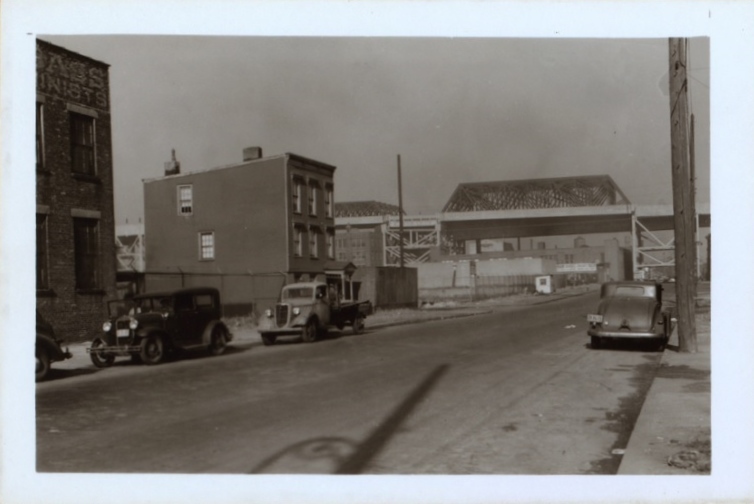 As a teen growing up in Windsor Terrace, Pat Fenton watched more than 1,200 families move out of the neighborhood to make way for the construction of the Prospect Expressway. 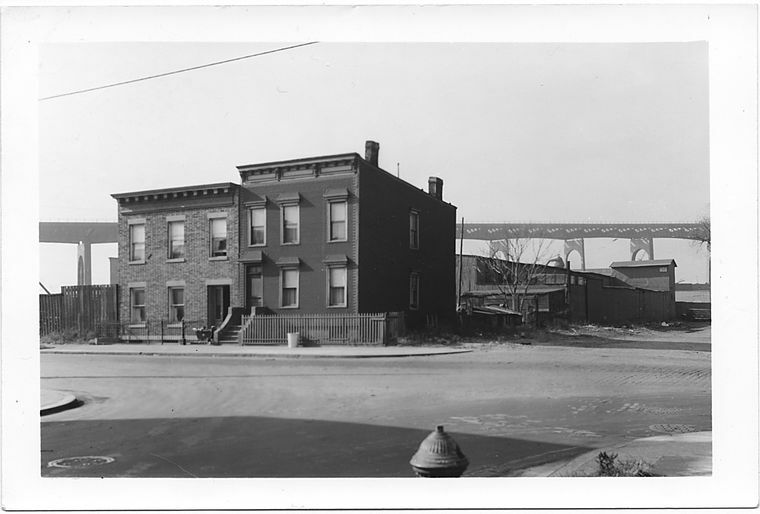 Today that piece of history seems as lost as the 400 houses that were bulldozed to build the Robert Moses-designed expressway, but Fenton has brought it back to life in his play "Stoopdreamer." The play, now showing at the Cell Theater in Chelsea, centers on three characters reminiscing over drinks at — where else? — the 82-year-old neighborhood bar Farrell's. "It's about the displacement of people and the sheer destruction," Fenton said. "The other part is about the change going on there now, the gentrification." And yes, with or without irony, kale is on the list of products. At 371 13th Street, where this lovely old frame house used to stand, a five-storey, three unit building is planned (NY YIMBY). I'm on the night shift for dog walking. I can't say I always approach this job with enthusiasm, but usually, once we're out of the house, I enjoy it. Most nights, I'll see a commercial garbage truck or two roaring through a route, guys hanging off the back, the kings of trash. I've tried to get photographs, but so far they've been duds. Photos of carting trucks by day are all well & good, but the glamour's absent. I love seeing all the trucks at night but this M & G '97 Mack's my favorite. Usually it's blazing, lit up like a fairground ride, but here in the video, as the owner explains in a comment, it's not at its absolute best. Still pretty fabulous though. Ferreira said he also wanted to create an “alternative mall” for local youngsters — harkening back to the halcyon days of his suburban childhood, when kids spent weekends at a one-stop wonderland where they could shop, catch a movie, and skateboard. 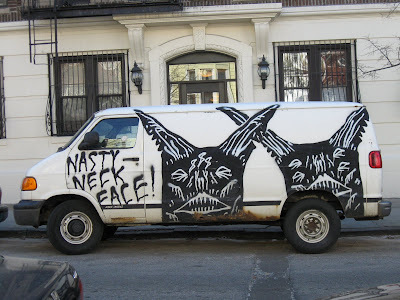 And with graffiti - the yarn kind, at least - so topical right now, let's go back to September '07 for a couple of graffiti & protest posts from the late, great, much-missed, Gowanus Lounge. Sales will launch and listings will go up this week for four luxury homes in South Slope’s 192 15th Street, Compass listing agent Gabriele Sewtz told Brownstoner. The newly constructed walk-up building is sandwiched by the area’s traditional crop of historic wood frame and brick houses. Units have 11-foot ceilings and four-inch-wide oak plank floors. The loft-like homes will range in price from $1,495,000 to $2,295,000, she said. 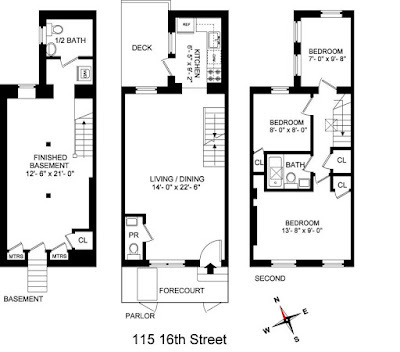 Luxury features include central A/C, heated bathroom floors, oversized showers and tubs, and Pella windows. When I saw the Sandy's sign disappear on 16th Street, I thought the new management had changed its mind about the name, but no, a new Sandy's sign will be up there soon. I dropped by yesterday, for the cafe's reopening, and chatted to Elia Adames, who opened Sandy's in the late 90s, and will still be checking in regularly. She will be also still be making the wonderful tamales that the cafe is famous for. Along with bagels, paninis, and other lunch & breakfast items, you'll be able to get a broad selection of Mexican food - be sure to ask what's available. The cafe's nicely set up, with plenty of seating in the side room, and tables out front, on the sidewalk. For me, Sandy's, and other small, family-run businesses nearby, make up a big part of what I have always loved about my neighborhood. Amidst all the changes of recent years, they remain constant, & they remain affordable. Go over to 16th soon - say hi to Blanca, Alberto, José & Benjamín. Grab a coffee, a bagel, a taco longaniza. Sit at a table for a while. You'll feel right at home. And here's another one, courtesy of prolific developer Boaz Gilad (Brookland Capital). 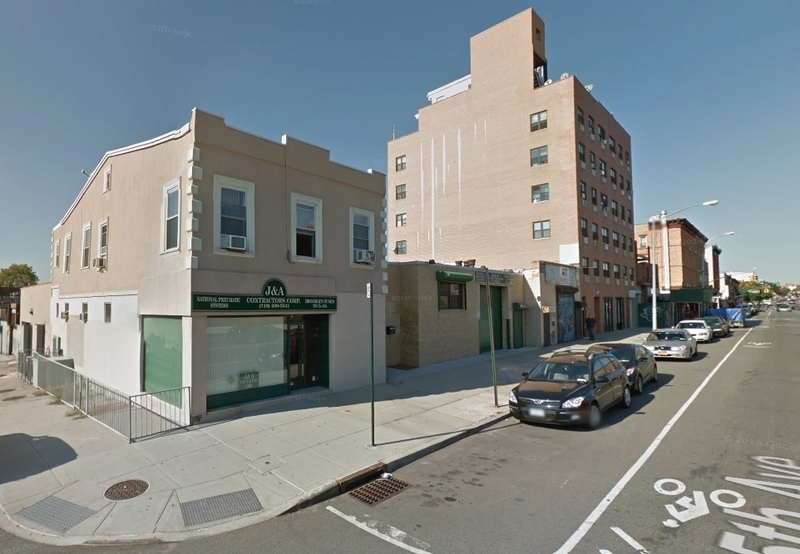 Plans have been filed for a new, six-storey building at 734-6 Fifth Avenue (24th Street). 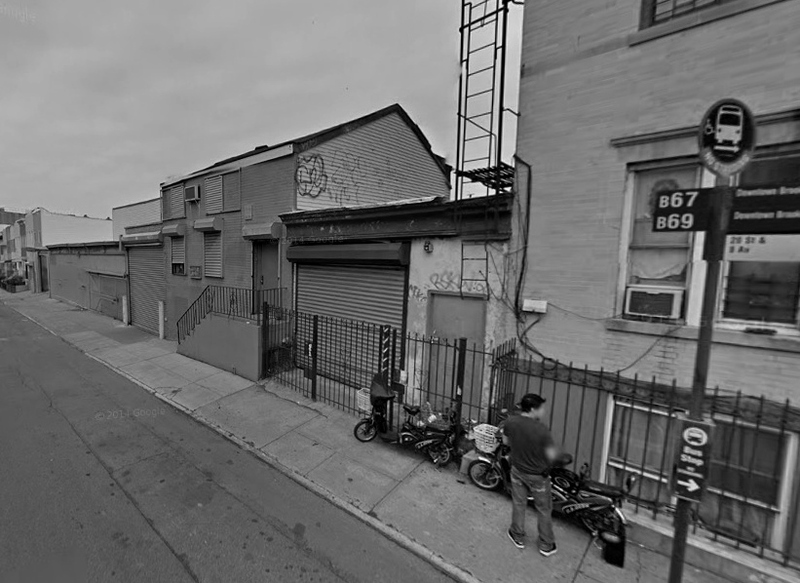 The site, last occupied by J&A Contractors Corps., was sold in May for $3,350,000. 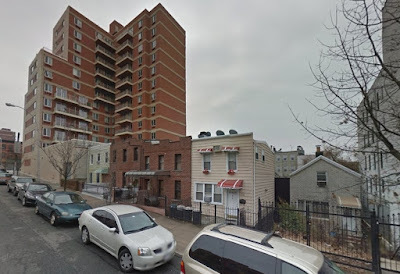 Those who follow local development activities in the neighborhood may recall that Gilad/Brookland are planning an 11-storey condo building at the south-west corner of Fourth & 15th (rendering here). 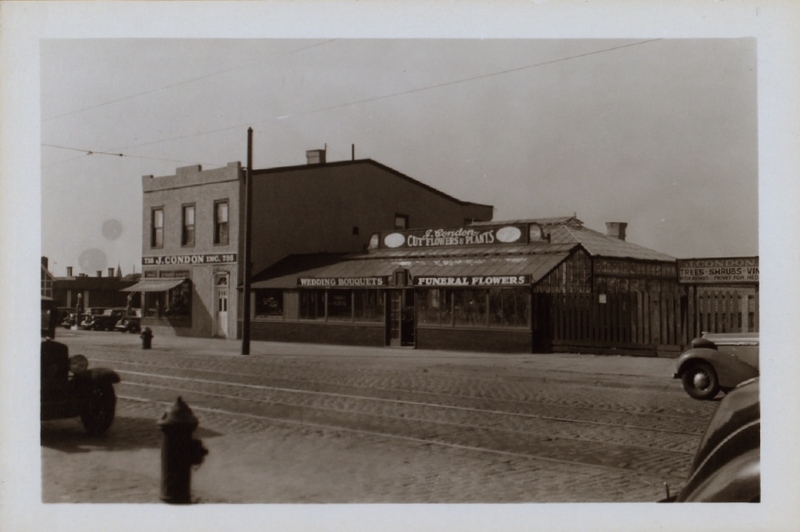 Back in July, I took a look at the florist & monument businesses clustered around Greenwood Cemetery a century ago. 734-6 Fifth were once part of the J. Condon florist business, there from at least as early as 1903 (probably earlier) & still on the avenue in 1941. The Condon greenhouses are long gone, but the building at the corner still stands on Fifth. It looks like the auto repair shop lot at 732 Fifth was once part of Condon's (half a greenhouse? ), and it too was recently sold. No change in usage indicated there as yet..
Girasol re-opened yesterday lunchtime. I had a late breakfast there, and watched a steady stream of regulars returning after the month-long renovation. A happy scene. I had no thought of taking out my camera. Though I'll confess to liking the look of the place just the way it was before , it's now very bright and open, with room for a few tables. You can pull up a stool to sit at the counter at right, and watch the griddle action (my favorite kind of spot), or perch at a counter at back of the bakery. There are smaller, less sociable, ledges to sit at by the wall on the other side of the room, & taking up most of the wall there, there's a bold, beautiful, traditional mural. Still open 24 hours. Still a menu to love. Still a pleasure to visit. We're lucky to have it still around. Welcome back. It's been a while in the works, but today The Real Deal reports plans filed for a 12 storey, 100,000 square feet building at Fourth & 15th Street, with ground floor retail at 541 Fourth. The building is slated to contain 125 residential units, according to plans filed with the city Thursday. They’ll occupy the third through 12th floors of the building, which will house 10 to 14 apartments apiece. The two commercial spaces on the ground level of the new building will total 10,800 square feet. The building will have a 26-car garage and storage space for 59 bicycles. The developers are planning to have a pet spa on the cellar level. 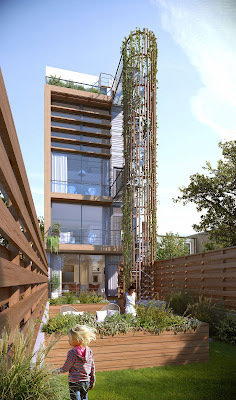 Recreation rooms for residents are also planned for the cellar, first and second floors. The units will be rentals, and the developers hope to start construction in December, said Karl Fischer, the architect of record. Brooklyn-based developers Aaron Karpen and Anshel Friedman assembled the nearly-block-long, eight-parcel site last year, paying $16.5 million. As the readers of this blog might know, we've been following this buy-up for the last year, watching as bit by bit, three-storey apartment building by three-storey apartment building, the parcel of properties was acquired. You can follow the trail here. This completes a sad quartet of development at each corner of the Fourth & 15th intersection. All corners taken. 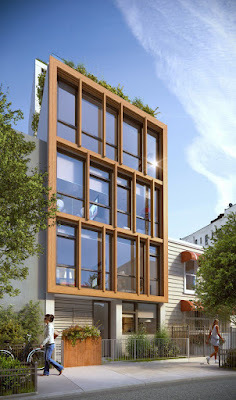 Here's a rendering of the new Mercy Community Residence, planned for the corner of Fourth & 12th. The address for the residence is 220 12th Street, but as we noted earlier, you'll only find DOB info if you type in 215 12th, a now defunct address between Fourth & Third. The rendering doesn't give very much away, but seems to the suggest at least part of the building will sit directly on the property line, Is this view at Fourth or 12th? No prizes for looks, that's for sure, but hopefully bright & comfortable inside for its future residents. There are no other pictures on the Nativo site right now. Yesterday morning I was waiting for the F train on the Smith & 9th Street platform. Even in an era when almost all travelers are clutching their smart-phones like babies with blankies, the platform views induce at least some riders to exchange their screens for another kind of hypnosis - some of the best views the city has to offer. I'm so obsessed with the views from the viaduct that, starved of its use for two years, in 2013 I took a day off work to be present at its grand re-opening. You can never tire of being up there. Yes, there's the Emerald City there in the distance, The View that developers crave, but I'm almost always focusing on things closer at hand, and marking the changes in almost thirty years of gazing. Especially in recent years. The Kentile sign gone. The Fourth apartment buildings, sprouting excrescences, spreading along the avenue. The Whole Foods, manna for the affluent, & opposite, parole center, bane of same. The Bat Cave, with End Stop & Frisk its last (or so it seems) public statement. Joan of Arc, no longer wielding her sword over basin waters. Yesterday, for some reason, I thought of the hairy-armed Neck Face graffiti that used to adorn the warehouse rooftops. Wonderful work. Later in the day, I read an announcement from The Park Slope Civic Council. Forth on Fourth, its community group working to promote "well-being, safety & vitality" on Fourth Avenue, is partnering with other local organizations to "Yarn-Bomb" the avenue with hand-knitted textiles later this fall. The textiles will stay in place for two weeks. The term yarn bombing is conveniently defined in the FOF public notice. 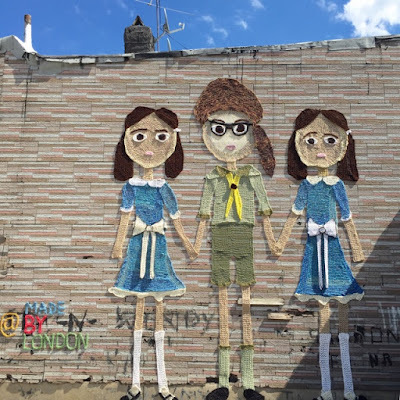 Urban knitting or graffiti knitting, a type of graffiti or street art that employs colorful displays of knitting or crocheted yarn or fiber rather than paint or chalk. Yarn bombing was initially almost exclusively about reclaiming or personalizing sterile or cold public places. Yarn installations are considered non-permanent, and unlike other forms of graffiti, can be easily removed if necessary. but I haven't noticed much committee action on this issue in recent years. I'd like to see housing at the top of the list. On the 1880 Bromley map of Brooklyn, Second Avenue between Hamilton & the Gowanus Canal is almost entirely empty of buildings. Between Hamilton & 12th up to the gas plant, & 9th & 8th Streets before the avenue ends by Fifth, land along the avenue is parceled into lots, but only a few of them are occupied: half a dozen frames between 15th and 14th (east), a solitary frame on the northwest corner of 14th, and a couple of brick buildings at the northwest corner of 9th Street. To the south of Prospect and north of the canal, the saw mills & coal yards are indicated, and on either side of Second Avenue a smattering of businesses are shown. The Doubleday cloth factory, the ammonia factory, and farther east by Third, the florists, the stone company, the photograph lithographer. The side streets are starting to fill in, plot by plot. There's some brick here, but wood predominates. 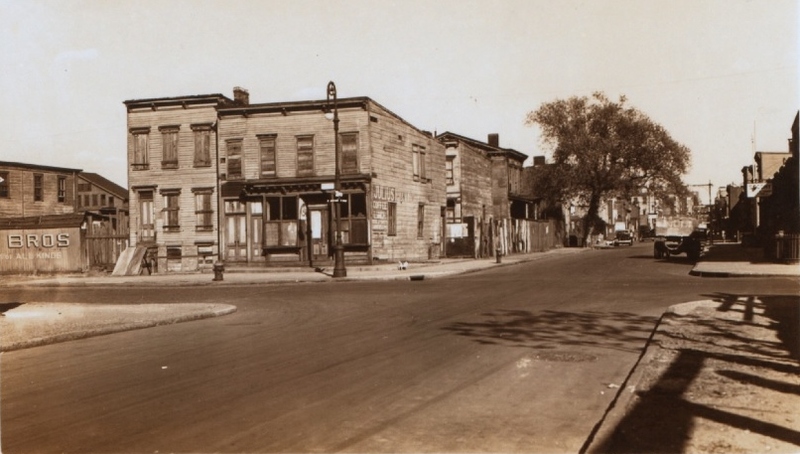 By 1886, the lots from 15th to 12th on the east side of the avenue are all filled in with wooden buildings, and a few lots on the west side are occupied. At 9th to 8th the lots are partially filled in, and a trio of buildings have appeared at 10th. A bagging factory appears. The Sanborn map of that year shows businesses unseen or unrecorded on maps of a few years earlier - a window screen factory, a stone carver's, Hobby & Doody's lumber yard. a lard & tallow oil works, sulphur & creosote companies, the Cream of Tartar & Tartaric Acid Works. Just looking at the map you'll get heady from the fumes. By 1903 the Belcher Hyde map shows some of the wooden houses between 15th & 12th making way for bigger structures & industrial use. Iron factories & galvanizing works appear on the avenue. The area's exploding with activity & the densely-crammed Belcher Hyde map lays out the frenzy on paper. Its Explanatory, key to the mysteries of road surface, building type, sewer pipes & trolley lines, is a map lover's dream. I'd love to see more early photographs of Second Avenue, particularly of those houses between 12th & 15th. The avenue appears all brick warehouse now, and any residential buildings seem to have vanished in the second half of the twentieth century. The only images I've found are from the 30s & 40s, taken by Percy Loomis Sperr, an invaluable guide to the streetscapes of the borough between the wars. All Sperr photographs are from the NYPL Digital Collections. Below, no houses, just an empty lot for sale at Second & 12th. Here, as in the Sperr picture above, you can see storage structures belonging to the Metropolitan Gas Light Company. Northwest corner of Second Avenue & 12th Street, 1941 & 2015. 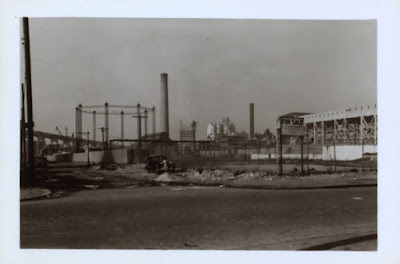 Today, Pathmark, Lowe's & Big J Liquors sit right on the site of the gas plant..
My favorite Sperr picture is of two wooden houses at the NE corner of Second & 14th. 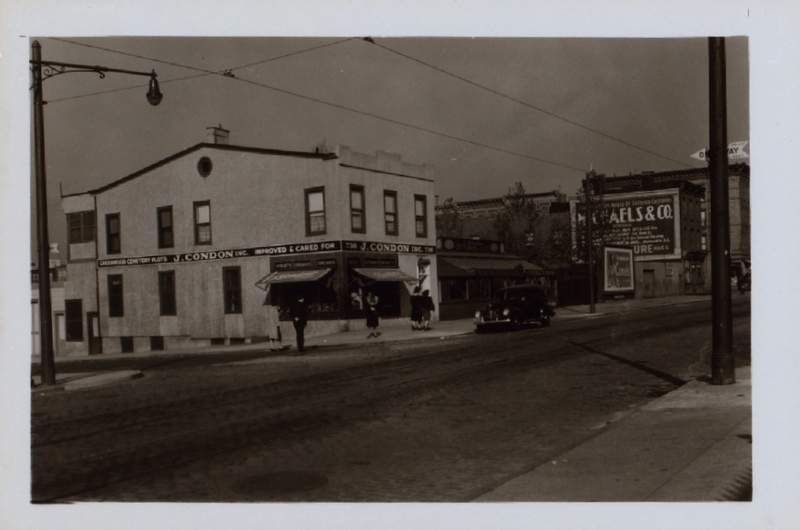 A 1935 streetscape straight out of the nineteenth century. It's hard to make out, but the (grocery?) store seems to belong to someone by the name of Julius. 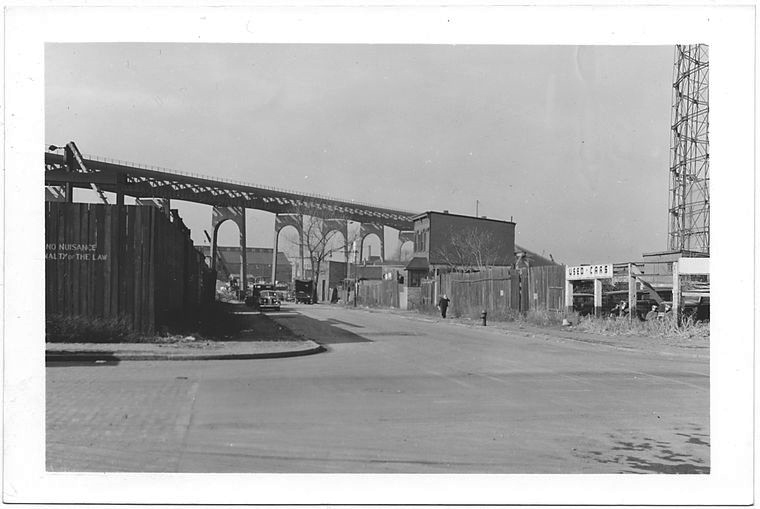 I'm assuming 175 - 179 were torn down & replaced by the brick building that stands there now. The SRB nightclub operated there recently, until its closure last year. I'm not sure what's taken its place. The Sperr picture glances the edge of the building across the street, but it lies in the shadows. Here it is, below, in 2015. I've walked past 181 countless times, but its brick facade fooled me into taking it for granted. Could there be another, older structure hidden underneath, one of the first few buildings on this stretch of Second? As I passed it the other day, I caught a glimpse of the back of the building. It hinted at a classic cover-up job. Other things about the building suggest its age. Those doorways on 14th & Second, with the little side windows at the sides of the entrances. And the placement of the side and rear windows up above. The long-standing business here is Ranieri F & Son Building Supplies, but the property is for now for lease. Update: Yes! It is an old wooden house. More here!